GridView just works like ListView, about which we learned in details in the last tutorial. The only difference is that GridView is used to display grid of View objects. The view objects can be a Text view, an Image view or a view group which has both an image and some text. Best example for this view is phone gallery which shows images in a grid. We can set number of columns to specific number and auto-fit the images into the columns. Vertical and horizontal spacing between every single items of gridView can be set by verticalSpacing and horizontalSpacing. In the last tutorial we explained how an Adapter converts data set onto view objects, which are then populated in AdapterView to create the UI components. Now our adapter view is GridView. You can refer the last tutorial for detailed explanations. We will define a ListView in the main layout XML file activity_main.xml. 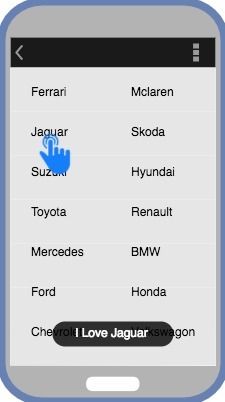 So for this, let's take an array of some amazing car brands. 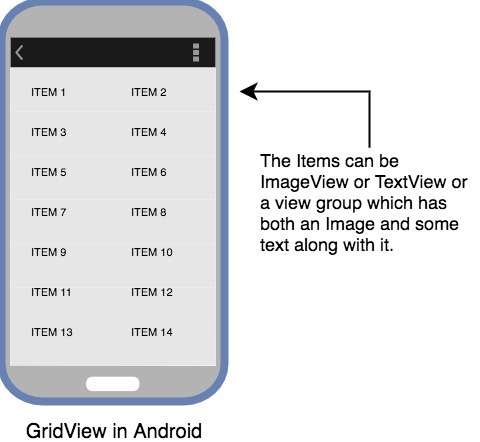 As our Grid will have only text values, hence we must define a TextView.